Hey there! The time to get the ex-laundry room ready to be the new office has arrived. I have procrastinated enough. Everything is ready to receive a coat of paint and to be furnish. Of course, like every single room in my house it will get only to 80% ready. Some of the art work and a file cabinet I am planning to buy will wait until, I get in the mood again. That is one of my biggest decoration lessons learned and advice if I ever have to give one. Don’t do anything unless you are in the mood and inspired. It will probably go faster and better and I am sure the universe will conspire for it, and everything will turn out perfect. If you force it, the chances for a disaster and an unsatisfied result will be higher. The only request my client ( a.k.a. husband ) had on the office is that the walls are not white. BUMMER! White is the OCD color that I love. 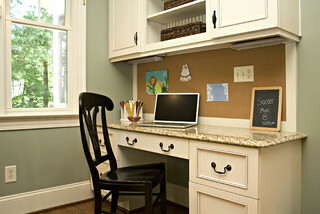 Its classic, any dirt can be seen and you can change the decoration around with splash of colors. Apparently, The Husband is a picky client and he also happens to be the only color blind person that enjoys seeing color contrast. So contrast it is. 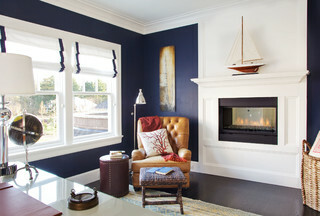 I went to Houzz to find some inspiration. 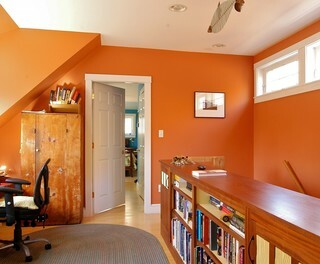 I tried to keep colors in the same scheme of the rest of the house which are SW – Maison Blanchet. The bedrooms and basement are SW-Pendiment. The office will be next to rooms that have SW-Toasted Pine Nut. Pumpking color… I don’t know. It is fall and I love this color at this time of year.. still, I would have to live with this for the other seasons and that might too much. Note the turquoise blue in the background. That is the view we have from the living room towards the end. So I want a duo contrast. Grey and light grey in the background…sounds so modern. Tuquoise and white… So happy and comfy. But maybe too girly? I love this light grey. It is fulfills my husband request of having a contrast with the white molding and my OCD side. Anything goes with light grey as well as white just so you know…light grey in brazil is also know as the “ice-color”. Sometimes, I wish I had the courage to paint a room charcoal. You gotta be bold. 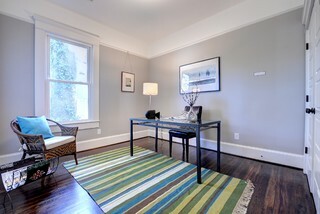 All your furniture practically needs to be white and your lighting in the room should rock. Blue again… but what called my attention is the actually the light brown… I realized how nice my current walls would look with some blues… this proofs that you don’t need to do white and blue for a beach style. This works too. Here we go again…. grey… and a brown rug! Maybe an accent wall pumpking? I just loved the ceiling in this room. Why not green for an office? 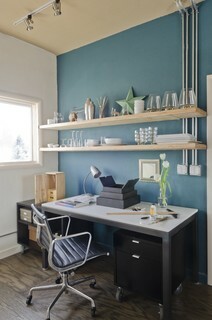 Contemporary Home Office by Calgary Home Builders Shane Homes Ltd. 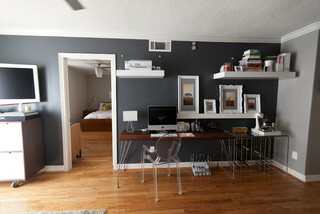 Finally, I thought, why not all light grey an accent wall dark grey, charcoal, navy blue or plum?